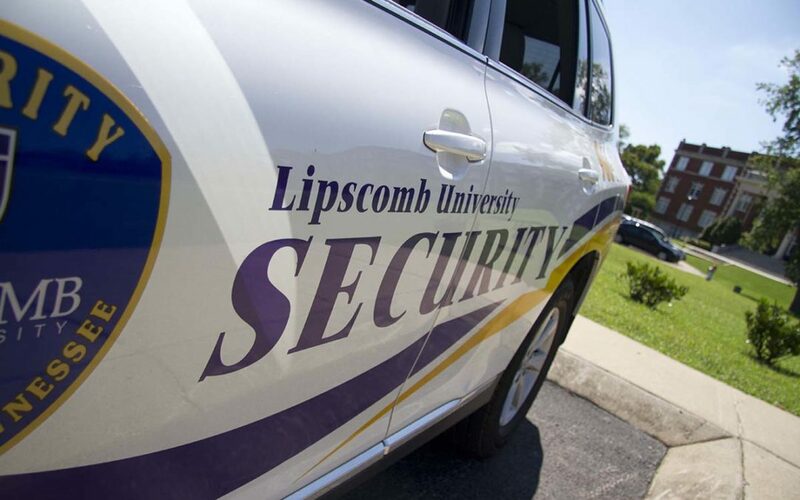 The majority of the calls Lipscomb Security receives are for locking and unlocking building doors or jump-starting students’ cars, but that’s not the limit to what the team is prepared to handle. Assistant Directory of Security Patrick Cameron said the staff tries to prepare for as much as it can since the scope of its duties can be broad. The staff carries out training at the Nashville Armory, where the team goes over different crisis scenarios such as bomb threats or active shooters on campus. All the officers are certified in CPR and receive defense training with mace spray and a baton, and several armed officers receive gun safety training and have carry permits. Cameron added that the one area they all agree needs improvement, however, is manpower. Lipscomb has fewer than 20 officers on staff, and shifts need to be covered 24/7. But in the end, the lack of manpower primarily comes down to funding. These technologies are what he calls “force multipliers,” a technology that will multiply the amount of work a single officer is able to do. One of the multipliers they’d like to incorporate is smart-cameras — cameras that use data analytics to alert dispatch when something unusual is happening in its view. Security has eight or more large TV monitors covering the walls of the office with dozens of camera feeds displayed on each, and that’s still not enough to display all the camera feeds at one time. Security would not provide the exact number of cameras but did say it was in the hundreds, and it doubled the amount of cameras within the last year. With so much information to process, these smart-cameras would be able to find the unusual events that a human would otherwise miss. Cameron said that another way they supplement manpower is through forming relationships with local law enforcement. “We have a great relationship with Metro” Cameron said. “They meet monthly with a group called Crime Stoppers, which is comprised of Metro, Murfreesboro PD and Belmont security, among others. Assistant Director Ryan Mobbs attends a CompStat meeting once a week, which is a meeting between all the heads of each precinct to discuss what’s going on in their areas.